Milestones: My First Blog Feature! 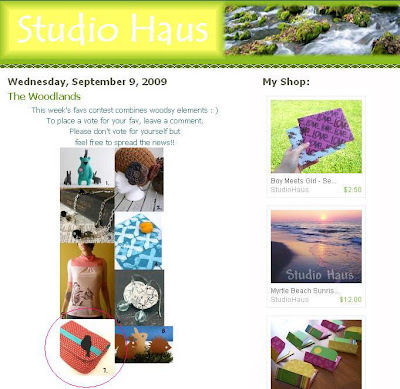 I just received a message from someone who's featured one of my items on her blog as part of a contest. Go me! It's pretty exciting stuff in my book. Anyways, go check out this lovely blog and shop and cast a vote for my little birdie bag (circled in pink)! I voted too! GO, V! I'll head over there and vote. Congrats, that's so exciting! Your work is beautiful!